This is indeed cool. Thanks. Thanks Mark … and thanks for your contributions! Thanks for this Cory. I’ve been using 64 bit for a couple months and unhappy that I couldn’t use Snoop anymore. Thanks for this – it’s very useful. In the version I’ve built, I don’t see the “(Default)” combobox in the Properties panel when it’s running. Is there a trick to seeing that? No, there isn’t a trick to that at all. I’ve never had problems with it showing up. Were you trying to integrate my changes with other changes? This is huge! Thank you very much! 1. Remove the auto refresh checkbox. I never use auto refresh, and every time before I Snoop, I press the “Refresh” button … just to be sure I’m snooping the latest version. 3. The problem John faced … is due to the installer project and the GAC. Now it doesn’t deploy the Snoop assembly into the GAC, and John seems to be using an old version … since the Injector loads the Snoop assembly from the GAC. To fix that, one should uninstall previous version of Snoop, and drag and drop newly built version into %windir%\assembly. Hi Anvaka … thanks for commenting. As to #1, some some colleagues of mine actually like the auto-refresh behavior (I do not, myself) and so I am going to leave that in for now … especially since auto-refresh is now OFF by default. As to #2, this is a very good idea. I like it and will try and see if I can quickly integrate it into what I’m sharing here with the world. As to #3, thanks for helping @John Schroedl out. I admit I am not an expert in Deployment projects and disabled it in the build configuration when something went wrong there … when I integrated the last changes. Maybe I should revisit that, so that people have the option of installing it yet again. I’ll see what I can do. Thanks for sharing this with the community. It’s a great help. I do have one suggestion/request: Snoop uses the default TextBlock defined in the application being Snoop(ed). My application is dark with white text. Therefore I cannot read anything in Snoop without first changing the default TextBlock Foreground color. I’d be happy to do it myself. Just need to go back and install C++ (I think). I tried this myself by creating a default style for a TextBlock and sticking it in the Application resources (of the application that I was planning on Snoop(ing)). And, sure enough, the main Snoop UI had white text everywhere (making it hard to read). This is due to the fact that the main Snoop UI is being inserted into the process being Snoop(ed). I tried a few quick things … to see if I could fix it (e.g. creating another default TextBlock style with black as the foreground and sticking that style in the Snoop UI resources section) … but nothing worked. I will have to think about this … and play with this some more to see if I can fix it. However, did you say you had a fix already? If so, send it on, and I will take a look. Your focus feature is now integrated. Thanks for contributing! If anyone has run into John’s problem, I recommend uninstalling all versions of Snoop (and making sure that Snoop and the managed injector assembly are not installed in the GAC) … and then reinstalling the new version. Why does nobody put all changes together as an open source project (of course with the copyright holders’ consent), and incorporate more changes? I think this is a great suggestion … and one that I’ve already considered, in fact. Let me try and contact Pete Blois to make sure that he is okay with that. Pete Blois just got back in touch with me and I am in the process of moving this source code to CodePlex. It might be a little bit, though, I am quite busy on the work front. Great news about getting this on CodePlex … have been waiting for that for a while. I thought maybe Snoop was not working on .NET 4 but perhaps I was seeing this 64/32bit issue. Nice job. I have a question. I have a complex interface, based on WPF. Is it possible to use Snoop programatically in a test automation manner? Many thanks, your version of Snoop works like a charm to debug a very complex application! Rene: As far as I know, Snoop wasn’t really developed with this in mind … but maybe you can use WPF’s inherent UI Automation support to accomplish what you are trying to do. Let us all know … by commenting back here … if you dive in on this. Has this been moved to CodePlex yet? And if not, at a minimum what is the actual licensing of this tool? It doesn’t seem to be Open Source and the assembly info seems to insinuate it is owned by Microsoft. Great tool, but unusable in any corporate environment where licensing is strictly enforced! Great question about licensing, @pkordes! I just assumed Ms-PL, but I will email Pete Blois. I have been so busy on the work front … but I hope to get this project published very soon. I’ll let everyone know when I do. @pkordes, I just got word back from Pete Blois. Snoop will indeed be licensed as Ms-PL and I will shortly be updating the copyright information in the source code. Just a comment to let people know … that I have put the initial Snoop bits out on CodePlex at http://snoopwpf.codeplex.com. See my blog post for more info. Looks great – I find these tools *really* handy on the shop floor of the code house! Great efforts on all counts. I was just wondering if there is any licensed version of Snoop to buy. If yes, kindly provide me the details ASAP. Just a comment that I finally fixed your problem above. It is available in the latest bug fix release for Snoop. It was quite an interesting problem! I wish that I could find a tutorial or something on using Snoop. I just downloaded it. 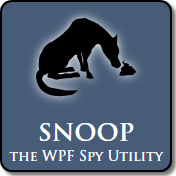 I have a WPF 4.0 app running and would like to “Snoop” it. 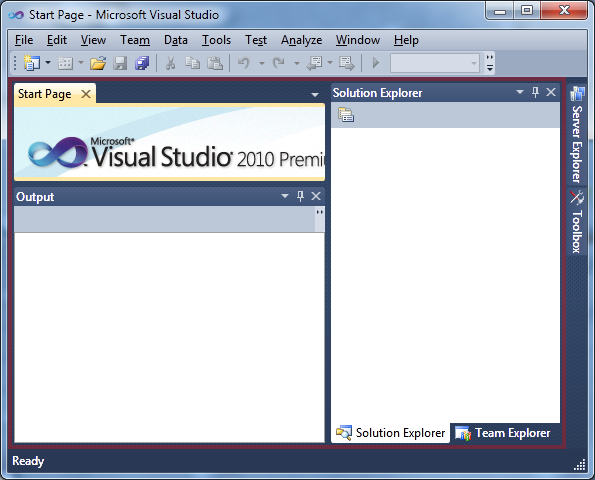 I click “Refresh” and expect that all the WPF applications would show up in the combo box but still nothing. How can I figure out how to get started with this cool tool? It sounds very useful and simple to use, but I am having no luck. Please help get me off the ground. 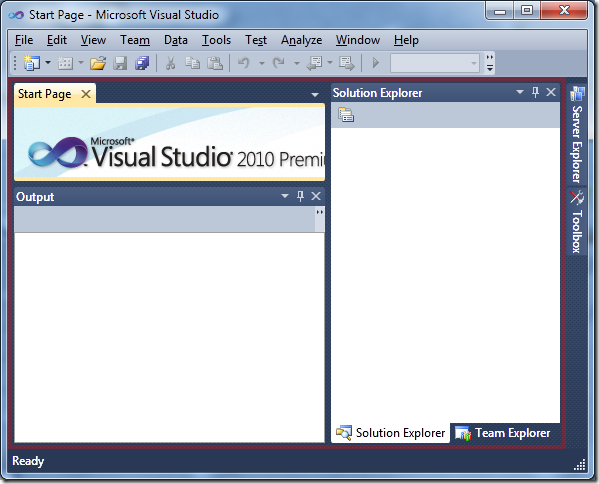 Ok, I got the 32 bit version and I am finally able to find things running in Visual Studio. 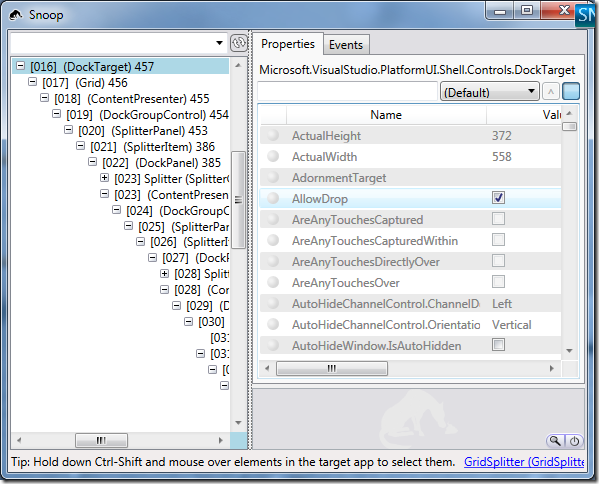 To be able to Snoop an app, must it be running in Visual Studio? Wow! Been messing around with it. This is looking good now. I held down Ctrl-Shft, moused around the app and things became alive. I can find things that my mama didn’t know about or where they are. Hey thanks Cory, it is late now but I can’t wait until tomorrow morning to get started at some depth. Please think about a quick start tutorial for dummies or something. Maybe with levels like 101, 201, 301, 401, graduate and post grad. This is really telling me a lot about WPF! @Les, currently there are 4 different versions of Snoop and you need to make sure you are using the correct one depending on your scenario. 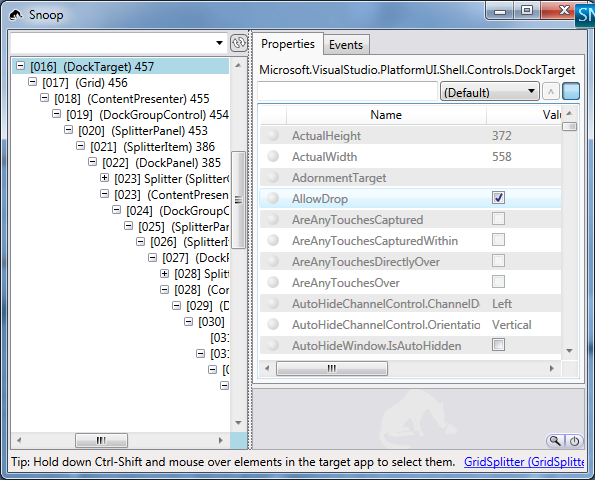 That is, if you want to Snoop a 32-bit application that has been built with WPF 3.5, you need that version. If you want to Snoop a 32-bit application that has been built with WPF 4.0, you need that version … and so on. I hope to fix this in the near future … as a fellow has already sent me changes to Snoop such that there is only one version and it figures out for itself how to handle the different situations. But as it stands, right now, you have to do that yourself. I bring this up … because you mentioned only seeing Visual Studio (with your application that you want to Snoop) in the application chooser’s combo box. This is because Visual Studio runs as a 32-bit application. I would speculate at this point, that the application you want to Snoop is a 64-bit application. Thus, if it is a WPF 4.0 application, you would need the WPF 4.0, 64-bit version of Snoop to do so. Again, I hope to fix this soon. @Les, as to your comments about a tutorial on how to use Snoop … this is high on my list of things to do. I hope to actually record some quick 5 minute screen casts, posting them to my blog and to the http://snoopwpf.codeplex.com site. I also plan on building out the documentation section of the CodePlex site. However, for now, the best source of info on how to use it, would be at Pete Blois’ site. Just scroll down a little. Glad to hear that you’re loving Snoop. 😀 It is an extremely useful little utility for WPF (for learning, diagnosing, and more). You are my best friend now. Careful, some people might not be happy if I told them that! But anyway, Snoop helped me find a binding error that has been messing with me for about 3 days. Driving me nuts! I haven’t found WPF to be too helpful at pointing out binding problems. It just quietly doesn’t work. No exception, no complaining, it just doesn’t work! This problem is why I was looking for a tool like Snoop last night. When I found Snoop, it looked like it might help me solve my problem. This morning, once I figured out what it could do and how to work it (still feebly I must admit), I quickly found the problem. I hope that you are having a great day … I am now. @Les, I’m happy to hear that Snoop helped you find your issue. Just a tip for being so kind! Thanks Cory, that is a cool little tip! I wish that I had known that when I had the problem. I just fished around the areas where I thought that the problem was and found them that way. But it is also helpful now because it tells me that there are no more binding problems. Thanks again, keep up the good work and have a nice day……Les.